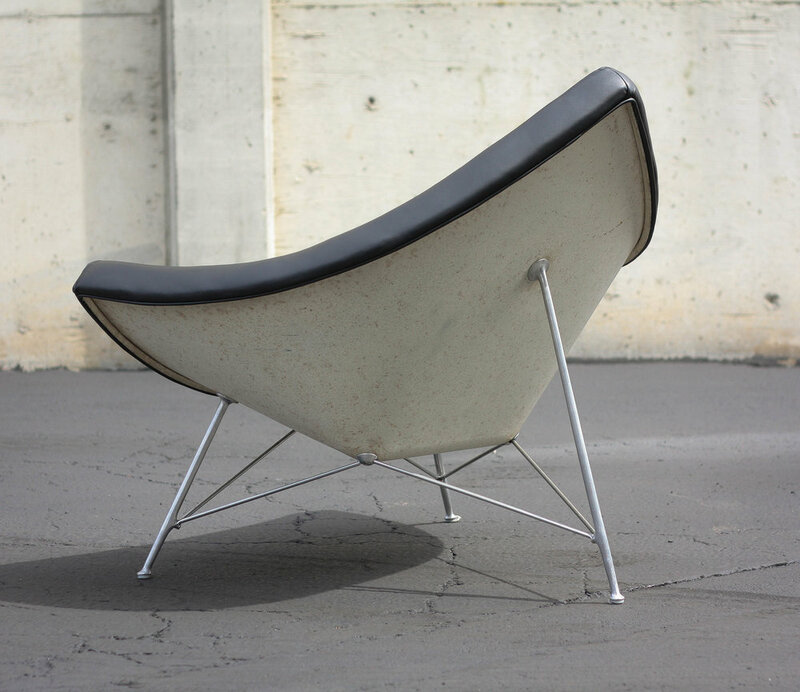 The coconut chair is an iconic design from the George Nelson office. The chair's frame is made of steel and supported by an aluminum tripod base. This chair is upholstered in a top grain black leather, which contrasts wonderfully with the metal shell. The design is low slung and allows for a variety of sitting positions. This specific chair is the more rare second edition version, where each of the three legs independently meet the shell. The first edition, and new production, coconut chairs have an unsightly crossbar that connects the two front legs. This second iteration of the chair was only produced for a short time and is much cleaner in appearance. We elected to forgo powdercoating the metal shell as we think the new foam and leather contrasts perfectly with the rich patina and history displayed on the metal frame. Excellent balance between old and new. That said, if you felt so inclined for $150ish you could have the chair freshly coated, sprayed, or enameled white again to look good as new.